I’m not a fan of frosting in general. Well, the kind you find on basic bakery cakes and cupcakes. Sorry. Most of the time I feel like I might as well just be eating a bowl of powdered sugar, and while I have an incorrigible sweet tooth I prefer my sweets dark and somewhat savory. Like I like my… nevermind. So when trying to figure out what would best compliment the perfectly airy gluten-free sponge cake I’d made, I should have gone with a traditional creme or lemon curd. But then the whole dairy-free thing makes it a bit time-consuming and complicated. I’d been baking a lot the day I made this cake. And I had a full Sunday NY Times waiting for me. And my roommate kept urging me into the living room to see what the Giants were up to (they lost, sniff. As did the Bengals, double sniff). I needed something fast and fluffy. Enter this frosting. It’s an incredibly versatile vegan frosting that would be stellar on cupcakes and pipes easily for pretty little decorations. And it’s incredibly easy, as frosting should be. I added the Chardonnay and blackcurrant to give some dimension and extra bubbly lift to the frosting, bringing it out of the blase buttercream family. While they’re each only tiny additions, you can really taste both the Chardonnay and the blackcurrant – each accentuates the other. And on such a light cake, the fluffy consistency of the frosting was a nice compliment. This frosting would probably be stellar on something chocolate. Ooh, or a spice cake! You can omit the wine and go full currant, or use milk and vanilla instead for a traditional buttercream. No matter which combination, just make sure to beat for a looooong time to get enough air in. Whatever you frost can sit comfortably at room temperature, but if it’s a hot summer day be careful of meltage and fridge for a bit before serving. Oh, and shortly after I took a bazillion pictures of the many things I had made that day, I accidentally erased ALL THE PICTURES ON MY HARD DRIVE! Hence why one of the few surviving ones is the sole representation here. Beat shortening and Earth Balance on hide speed until smooth and fluffy, about 3 minutes. Add powdered sugar and beat until light and fluffy, about 3-4 minutes. With mixer still on high, add blackcurrant a tablespoon at a time until incorporated. Add Chardonnay a tablespoon at a time until incorporated. Beat for 7-10 minutes until airy and light, adding more powdered sugar to your desired taste and consistency. This is remarkable. I wonder if you could use fresh black currants in this if you blended them. I love this. This is definitely a unique frosting recipe, the flavor blend is awesome! 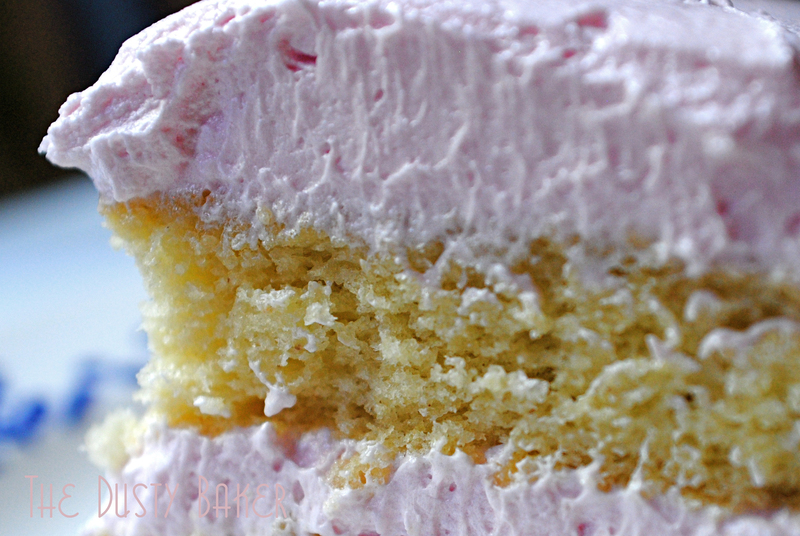 Always looking for a frosting that is a showstopper and this is it. Thanks for sharing. Love how unique your frosting is. I can imagine how wonderful it would be on a delicious chocolate or spice cake. Thanks for sharing your recipe. Yet another great post Dusty! Good stuff. Thanks FFer… hmm, that doesn’t work either. Nickname TBD. This is amazing. I’m just like you, not keen on these cupcake toppings – far too sweet but this one is an absolute winner. Wow – blackcurrant is wonderful and it certainly looks light and fluffy but also the addition of the cold Chardonnay? Genius.